Three years ago today I switched my blog from my Apple hosted website to WordPress – and I have never looked back! Three years of networking and utilizing a great platform to share. Thank you to the 500 + followers for your support and interest. This is the time of the year when I spend time to reflect and project. 2014 went by in a flash… again. I am afraid to tally up the days I was on the road as I have a feeling they almost outweigh the days spent at home and close to the studio. Yes, once again I have had very limited time in the studio. Most of the studio hours were spent assembling kits, reviewing teaching contracts and managing my calendar. Oh how I yearn for some uninterrupted time fondling fabrics, sampling new threads and developing that new body of work I started last April. I have heard rumors from across the country. “I haven’t seen anything new from Anna for while…” Well, I am sketching, selecting and gathering supplies and I am not lacking ideas and inspiration. All I need is time! When I am on the road I just don’t have the energy to spend time stitching at night on poor light in a hotel room or our camper. Just the other day I updated my blog calendar and I realized that I am fully booked for 2015. I am not accepting any new bookings for the upcoming year. And when it comes to 2016, I plan to reduce my teaching further. The first major decision to start managing my life better I made several months ago. I decided to resign from the Quilt Judging Certification Programme. For the past 5 1/2 years I have worked closely with my teaching partner first developing the teaching and student manual, administrating judging apprentices progress, corresponding with the apprentices and my co-presenter, writing and co-writing articles for the Canadian Quilter Magazine, updating the manuals on an ongoing basis and presenting the programme every two years to a new cohort during Quilt Canada. It has been a wonderful experience and I have learned so much about quilting and myself. And now it is official – I had a personal call from the president a week ago and I shared my decision. I will complete my commitment to the Quilt Judging Certification Programme in June in Lethbridge (during Quilt Canada 2015). Once I hand over my responsibilities next June it will free up much of my time between travel and teaching to spend in the studio. After all, I studied to be an artist and it is time to return to the studio to follow my true passion. 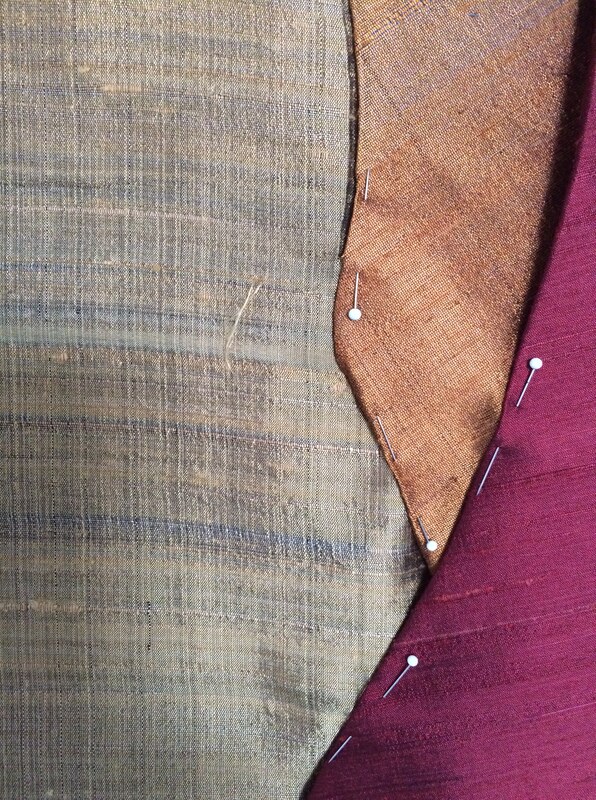 With that decision made I was full of renewed energy, and I have started a new piece (sneak-peek images above) . 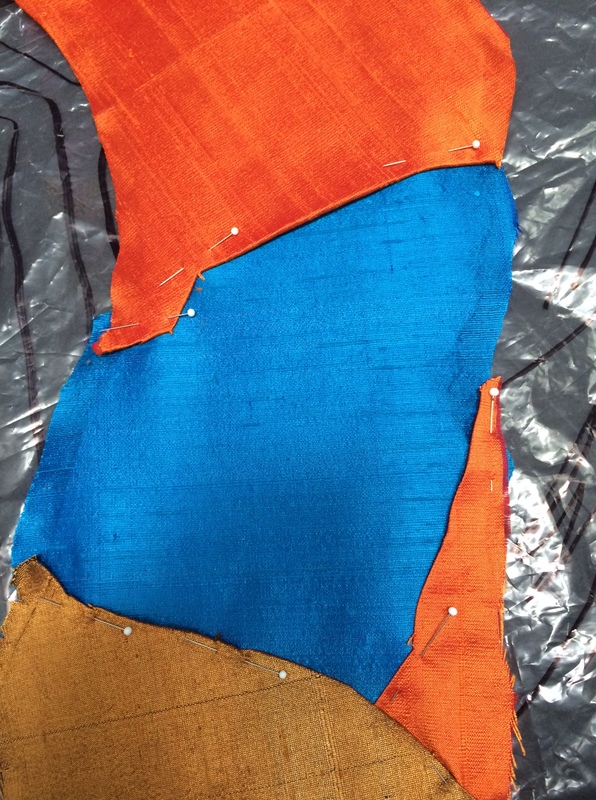 I am working with silk, and I like what is happening so far… I plan to layer, distress, manipulate and hand embellish. I have a couple of days to work on this while I also pack for my last workshop of 2014 in Calgary. Oh yes, and then it is time to fly out to spend my first Christmas in a very long time with my sister (and her family) in Germany. Get ready for some images of Christmas markets soon! Can’t wait for the magic! 06 Dec	This entry was published on December 6, 2014 at 12:41 pm. It’s filed under Creativity Update, Design, Journaling, Networking, Special Project and tagged blogging anniversary with Wordpress, knitted shawl, making decision, quilting with silk, reflecting, that time of the year. Bookmark the permalink. Follow any comments here with the RSS feed for this post. Have a blast at the Christmas markets, Anna. It’s our last year in Germany and we are packing as many markets in as we can. So far this season we’ve been to Oberursel, Nuremberg, Wiesbaden, Basel and Colmar. Next up is Vienna where we are meeting the family & seeing the best (IMO) Christmas Markets anywhere. Have a wonderful Christmas season & I look forward to seeing more of the new work in the New Year. HI Nan, Enjoy your last year visiting Christmas Markets in Germany and Austria While this is one of the reasons for our visit this time of year, I will be happy to take in a couple of markets near Bonn and then Salzburg. Salzburg has always been my personal favorite. It is smaller than many but has that true Christmas Market charm that i remember from my childhood and youth. Looking forward to having you back in Canada soon. Margaret – thanks for your interest… right now that pattern is a bunch of scribbles on a sheep of paper (or better, several…). I have knitted it three times now and each time I make a bunch of changes… all in all I start with 6 stitches and work out from there. The lace rows are yarn over and knit 2 together. – I am packing for a class in Calgary on Wednesday and then we are off to Germany Thursday. I will see what the New Year brings. Thanks – here is to the next year! The decision is an excellent one for you regarding more personal work time. It is what actually motivates ideas and truly relaxation for the soul. Happy Xmas and best for 2015. Enjoy your family and kick back with you feet up for a few days. I know that is hard for you to do but it will renew your spirit and the tension will slowly leave. Thanks, Patsy. 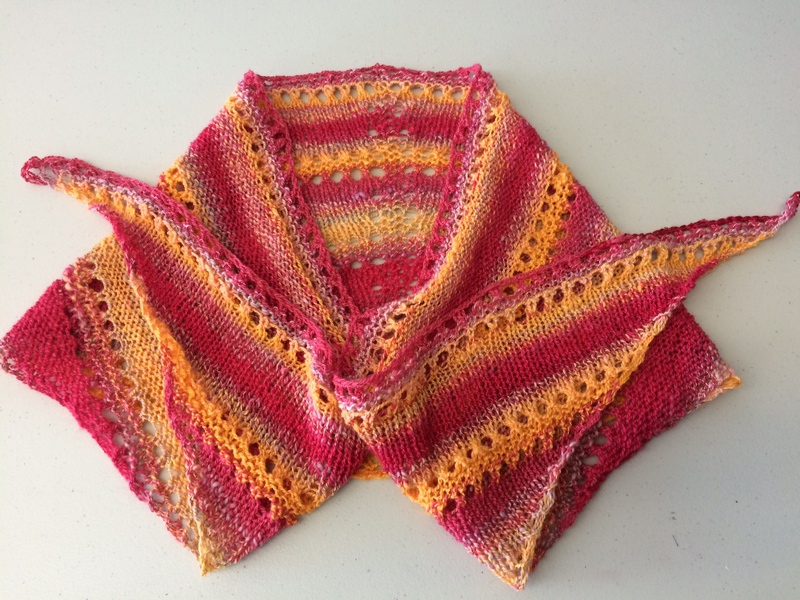 It is not a big shawl – and before I was a quilt artist I had a knitting store in Calgary. 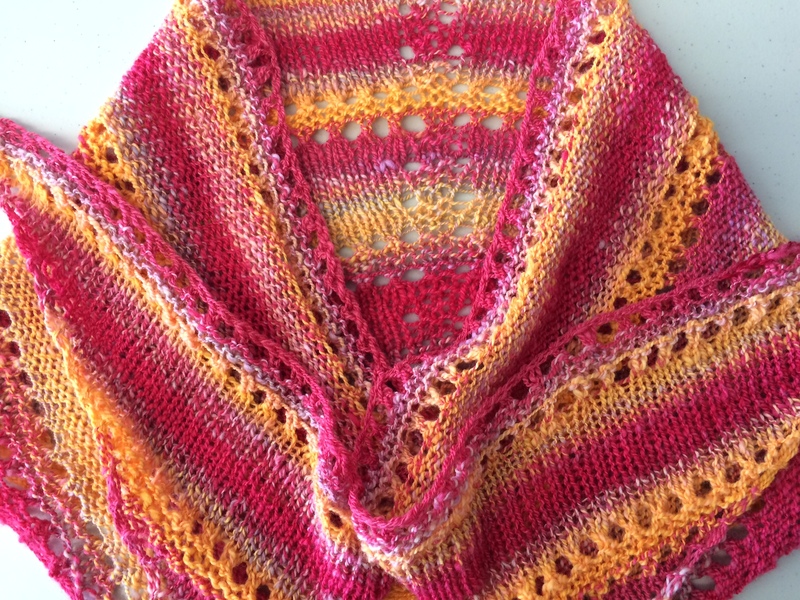 I have knitted since I was 9… I use it to realx, especially during the winter months. Great! By now there should be a pool of new judges and at least one person who can continue that work while you get back to your main passion. Pent-up ideas will lead to interesting results. Thanks, Pat! I am sure there won’t be a problem filling my position. I feel good to finish up after all this time. I singe don for two years originally… how time flies! Good for you… Excited for you to focus on your work. Looking forward to seeing the fruits of your labour! Thanks, Theresa! Yes, it is exciting to look toward a future filled with art and selected teaching gigs.